Ravenna in Italy is justly known as the City of Mosaics, for several of its religious buildings are adorned with colourful, ornate mosaic panels which are so detailed, bright and life-like that it is difficult to believe that they were made in the 4th and 5th century AD. 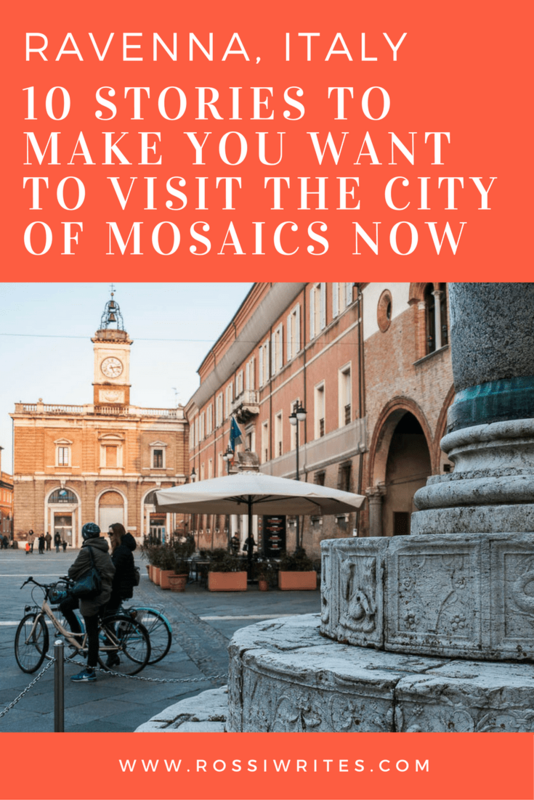 If you look beyond the mosaics though, you will discover several other facets which make a visit to this city in the Italian region of Emilia-Romagna a must. 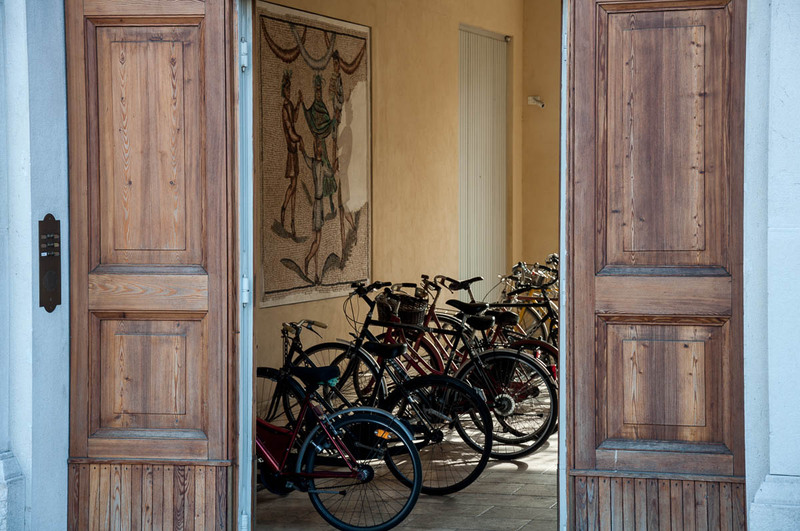 So, here, today I want to share with you ten stories coupled with many pictures as a quick and intriguing introduction to Ravenna. Mosaics are, of course, mentioned, but beyond them, I also want to reveal to you some of the other faces and features of the city the way I saw them during a flying visit at the end of February this year. Of course, you cannot talk about Ravenna without mentioning its Byzantine mosaics in the same breath. Hence, I am not going to dispense with tradition here. Especially as the main reason for my visit there was precisely to see them. Yes, they are absolutely stunning! Beautiful and breath-taking. Walking all over Ravenna’s historical centre and visiting one after another the Christian religious buildings which contain them, you cannot stop marveling at the creative spirit and the incredible patience of the artists who put together tiny pieces of glass and stone to create huge panels which rival the best frescoes out there. 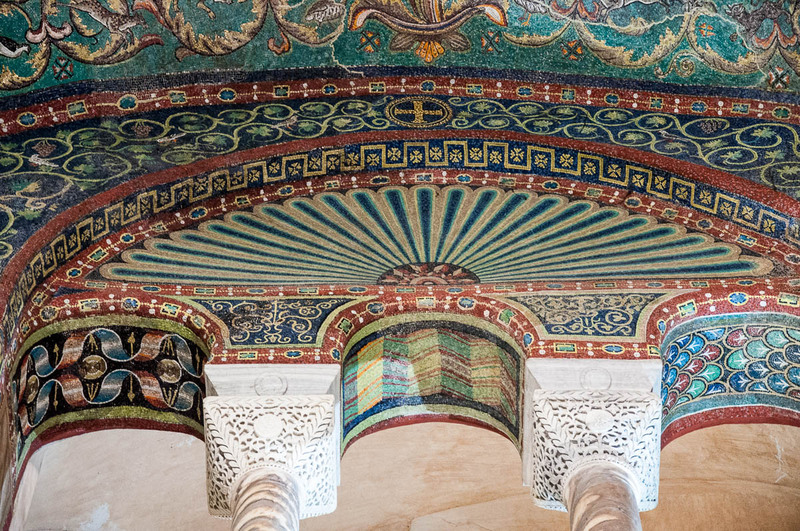 There are eight UNESCO World Heritage sights to visit in order to admire the best Byzantine mosaics of Ravenna. I managed five in the three hours I had at my disposal before they shut for the day: the Basilica of San Vitale, the Mausoleum of Galla Placidia, the Baptistery of Neon, the Sant’ Andrea Chapel and the Basilica of Sant’Apollinare Nuovo. The first two and then the second two are right next to one another, which made my task slightly easier. Yet, I wanted to spend as much time as possible in each of the five in order to look at the mosaics and really see them. I didn’t want to simply rush in and out, to tick them off my travel wish list. Instead, I wanted to feel the atmosphere of each sight, to notice the small details, to let myself be overcome by those emotions which take hold of us when we are enraptured by a genius work of art. Hence, I didn’t manage to make it to the other three important mosaic sights, namely: the Arian Baptistery, the Mausoleum of Theoderic and the Basilica of Sant’Apollinare in Classe. I am OK with it, as it gives me a legit reason to return to Ravenna. In any case, let me tell you – the mosaic sights I did manage to see easily constitute one of the highlights of my life here in Italy. 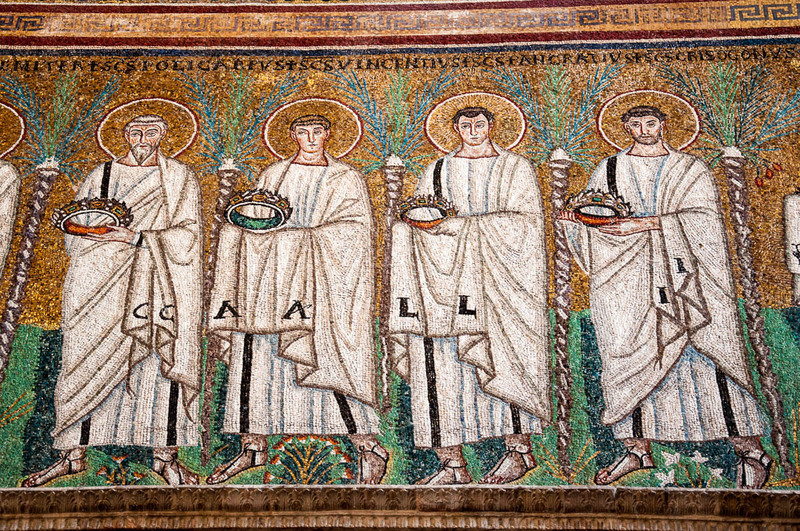 If you are ever in a situation to wonder if you should spare the time to visit Ravenna, please, take my earnest advice – definitely go there and see the mosaics. Even if you have just a limited time at your disposal. It is more than worth it. Above are just a few of the hundreds of pictures I took of the different mosaic panels and compositions. It was an impossible task, really, to aspire to capture in two dimensions the beauty and the impact of the surfaces covered in tiny pieces of mosaics in, what it seemed, thousands of different hues and colours, which so realistically depicted saints and humans, plants and animals, the Celestial Kingdom and earthly rulers. 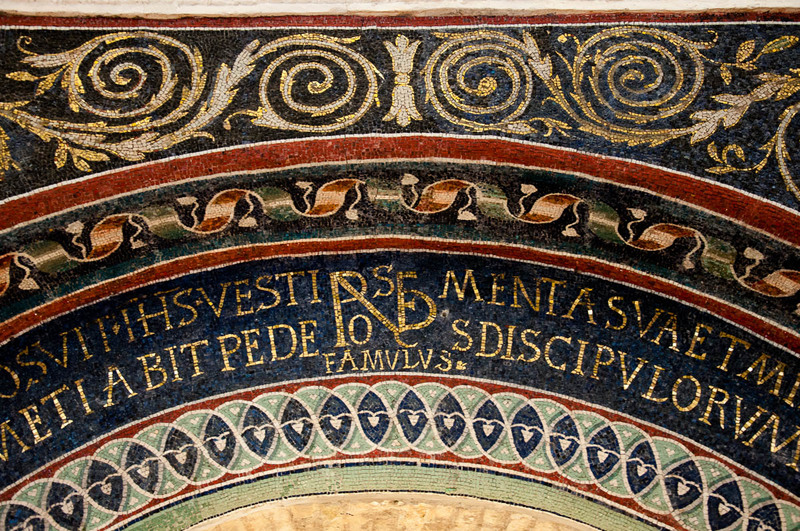 Very soon I will be telling you in a separate blog post much more about Ravenna’s mosaics and how to see the maximum of them in the minimum amount of time possible. So, as they say, watch this space! The bright yellows and the muted pinks of Ravenna really caught my attention. I love it how brave Italians are in terms of painting their houses and buildings in the most daring of colours. It really makes the architecture stand out under the blue sky, uplifting both the soul and the urban environment. Whereas British cities seem to be grey and serious by default, their Italian counterparts take advantage of the full scope of the rainbow. It was a somewhat dark and dire day during my visit to Ravenna, yet my mood was immediately improved when I came across the above fabulous yellow buildings. The first one is the local theatre and the other (in the third picture above) served as a glorious backdrop to the Garibaldi’s statue. Like little suns they stood out and spread that joy of living that Italy is synonymous with. 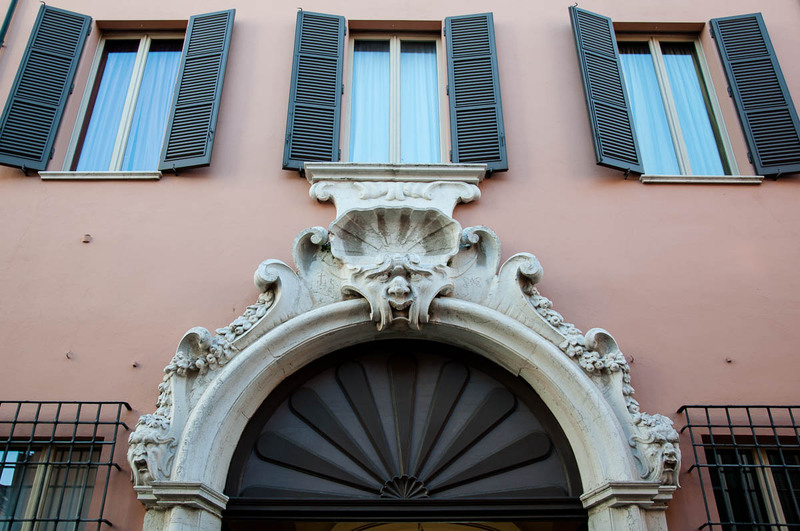 My eye was also caught by Ravenna’s big houses in muted peach-y pinks. 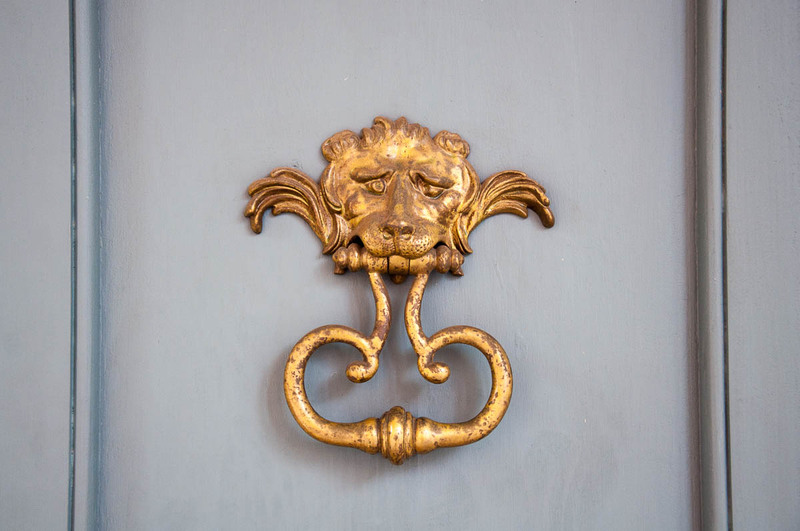 They were big and imposing, often adorned with sculptural motifs, giving the historical centre a very grand feel to it. 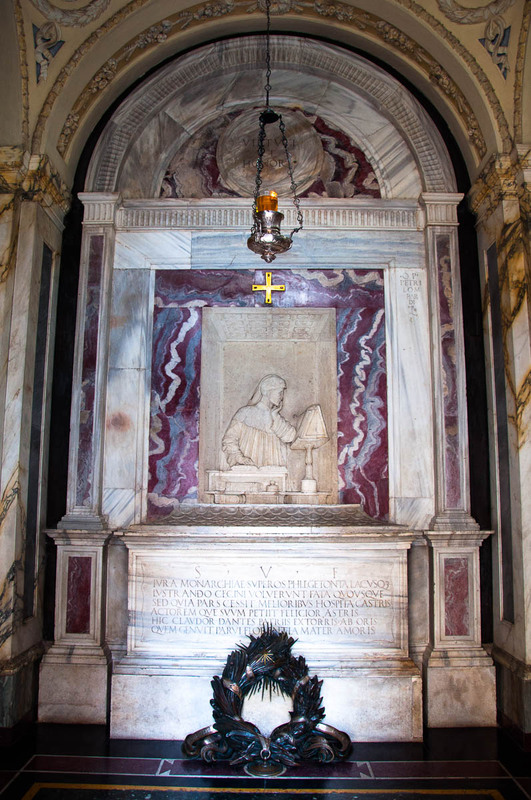 Now, I have to be honest here and admit that until my visit to Ravenna, I actually didn’t know that Dante – the big Italian poet of the Divine Comedy’s fame – is actually buried there rather than in Florence. As it happens, Dante’s Mausoleum was the first major sight I came across in the city and I spent as long as I could there just taking it all in. 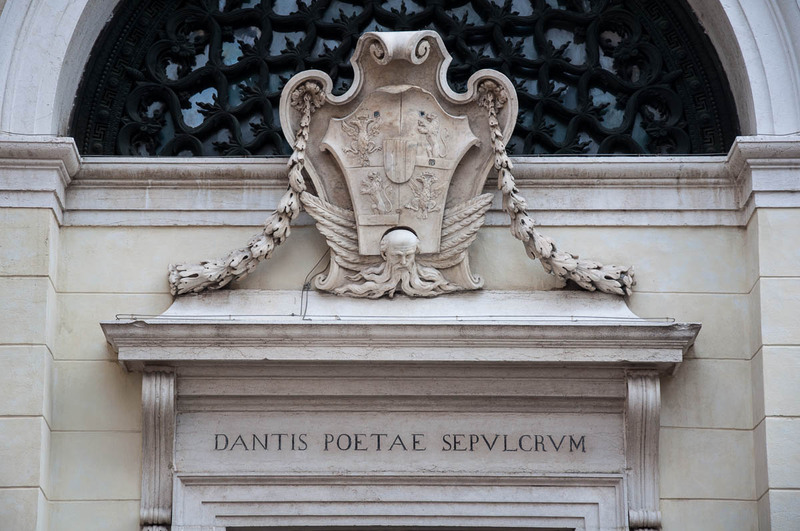 The poet died in Ravenna in 1321 as an exile. He had had to leave his beloved Florence after falling out of favour with the powers that be. Funnily enough, two centuries after his death, Florence suddenly decided that it would be a good idea to have him back, so the Florentines built him a lavish memorial and sent for his bones. Ravenna showed some backbone though and refused to surrender them. Instead an empty coffin was sent back. Dante’s bones in the meantime were hidden by Ravenna’s Franciscan monks. The hiding spot was later forgotten and the bones were found by chance only in 1865 during some renovation works. 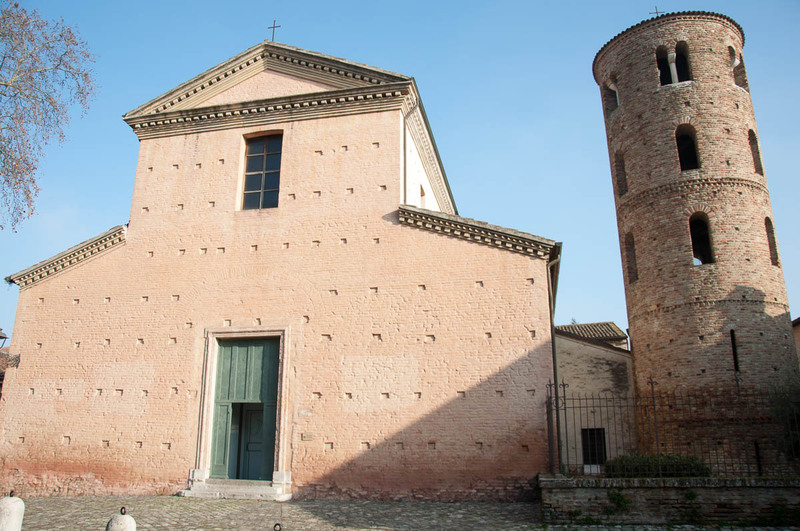 Interestingly enough, a mausoleum had already been commissioned for the poet’s remains and built back between 1780 and 1782 in Ravenna. Dante’s bones have been resting there since they were found again with one notable interruption. In the small courtyard right next door to the Mausoleum, there is a mound of earth covered by green creeper plants. It is where Dante’s bones were buried during the Second World War to ensure that they wouldn’t be lost if Ravenna was hit by enemy fire. Lastly, one curious detail. 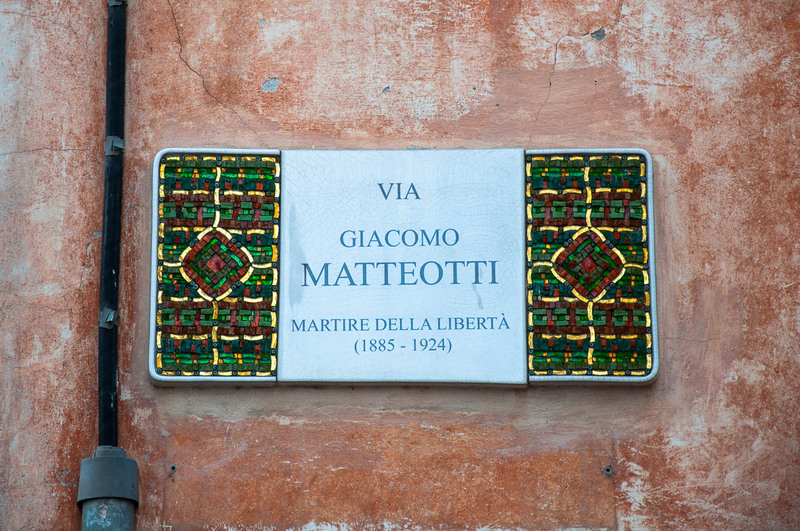 An olive oil lamp burns inside Dante’s Mausoleum every day. The oil is from the Tuscan hills and it is offered by the Municipality of Florence every September. 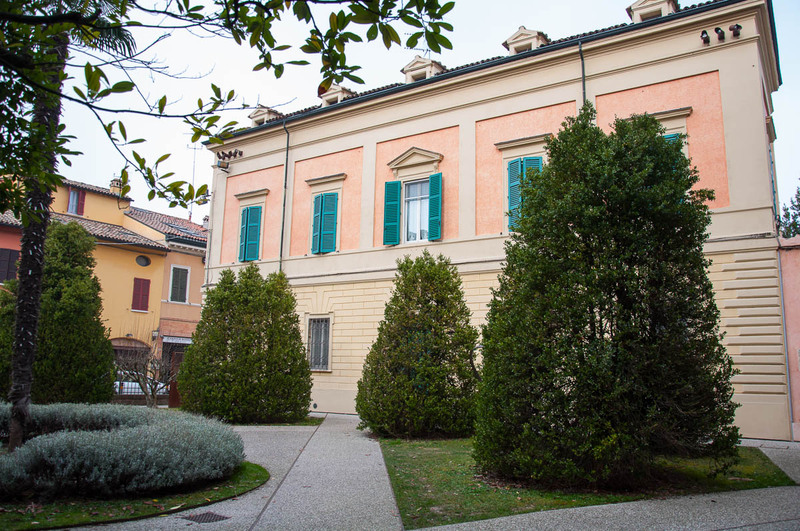 The Mausoleum is on a small quiet street in Ravenna. There was no-one around there (apart from a couple of locals talking nearby), when I visited on a grey Monday afternoon. It is possible that during the high season there are more people flocking to see it, but, I would imagine, it would be nowhere near the crazy touristic frenzy the Mausoleum would have provoked had it been placed in Florence. 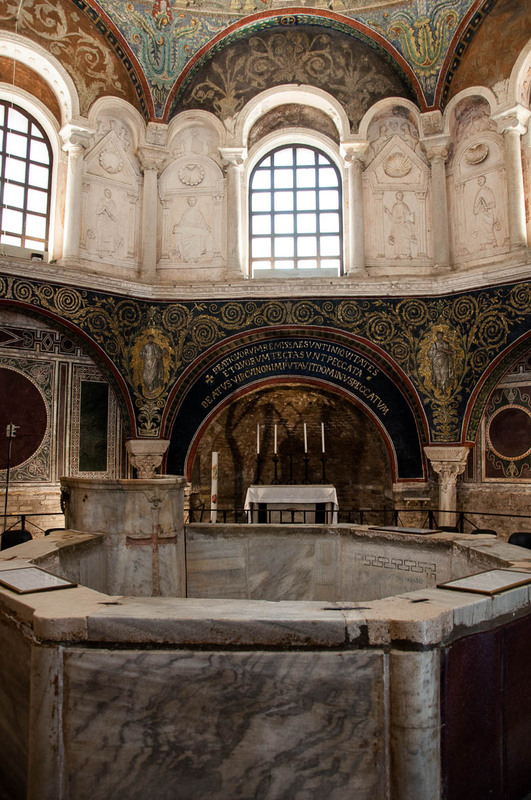 Click here to see a short video of Dante’s Mausoleum and the earthly mound, which I took in Ravenna and posted on my Facebook page. I am rapidly becoming obsessed with the weird and wonderful pine trees which grow here in Italy. They look nothing like the traditional coniferous trees we have and use, for example, for Christmas wreaths and decorations. Instead they have a very tall spindly trunk which is crowned by a mass of green branches widely stretching their limbs horizontally to the ground. These are the stone pines, also called umbrella pines for their visual semblance to an open brolly. 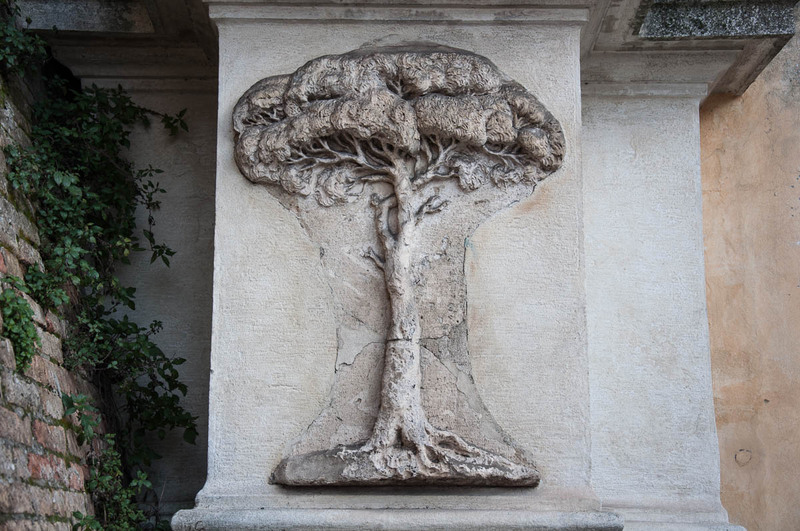 Unfortunately, we don’t seem to have them here in Vicenza (where I currently live) and, since seeing a stone pine in the garden of the birth house of the Neoclassical sculptor Canova, I have been a sucker for this proud and beautiful tree. Not to mention how much I like its edible pine nuts both whole and as a vital ingredient of a good pesto. 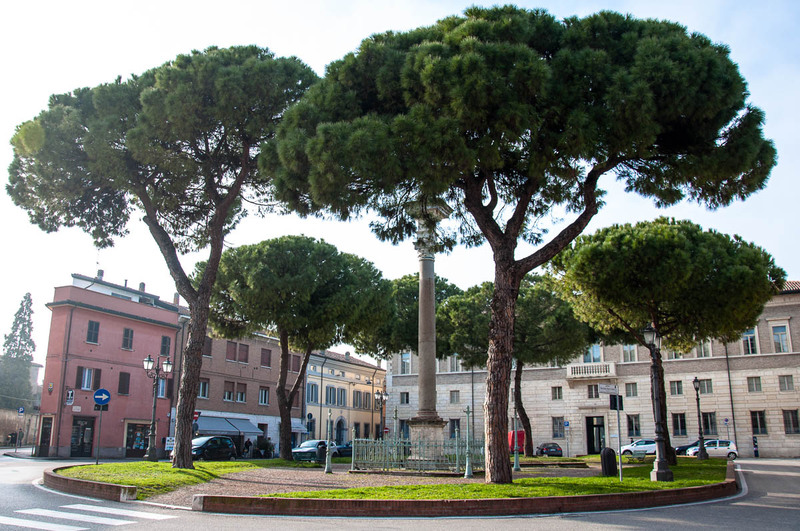 Hence, I was delighted to come across many of these trees in Ravenna. There were whole avenues, squares and alleys lined up with them. 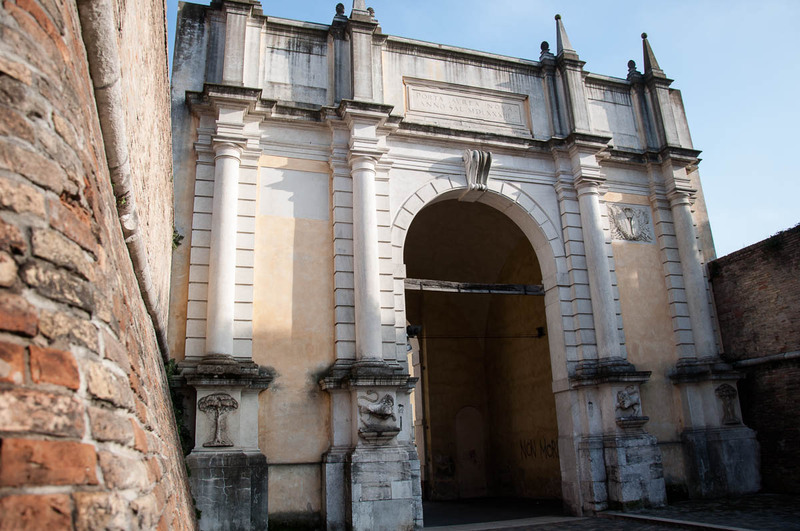 Plus a sculptural representation of a stone pine tree can be seen on the huge Porta Adriana – the Western gate in the thick defensive wall which guards Ravenna’s historical centre. Apparently, the stone pine bas-relief was originally placed on the Porta Aurea (the Golden Gate) together with several other sculptural symbols of the city. That gate though was torn down in 1540. 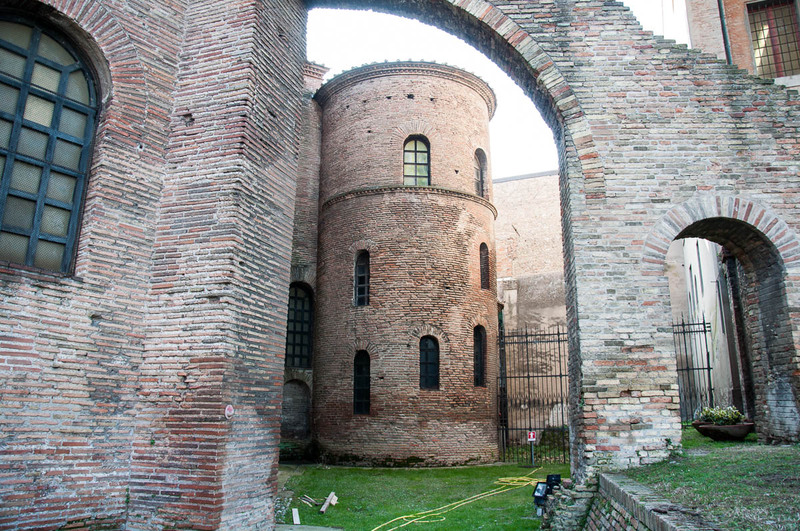 Rushing through the historical centre of Ravenna, I came upon Porta Adriana – a huge yellow structure on the Western side of the city’s partially preserved defensive wall. I walked through the gate, curious to see what’s on the other side. Well, nowadays obviously the city spills beyond the limits of its old nucleus, so I saw avenues and streets leading down to its modern quarters. What made an impression on me though was how thick the preserved sections of the defensive wall were. Ravenna’s wall was first built in the 5th century AD by the Emperor Honoris and was then modified several times in the centuries to follow. Nowadays only sections of it are preserved, as in 1863 the wall was partly demolished to make space for the railway station. Several of the original gates in the wall are still standing. Apart from the Porta Adriana, which I had the chance to see, there are also the Porta Serrata, Porta S. Mama, Porta Nuova and Portonaccio. Add to this a 15th century Venetian-built fortress called Brancaleone with a citadel and four circular towers where nowadays there is a public garden. The gates and the fortress are definitely on my must-see list for a future re-visit of Ravenna. 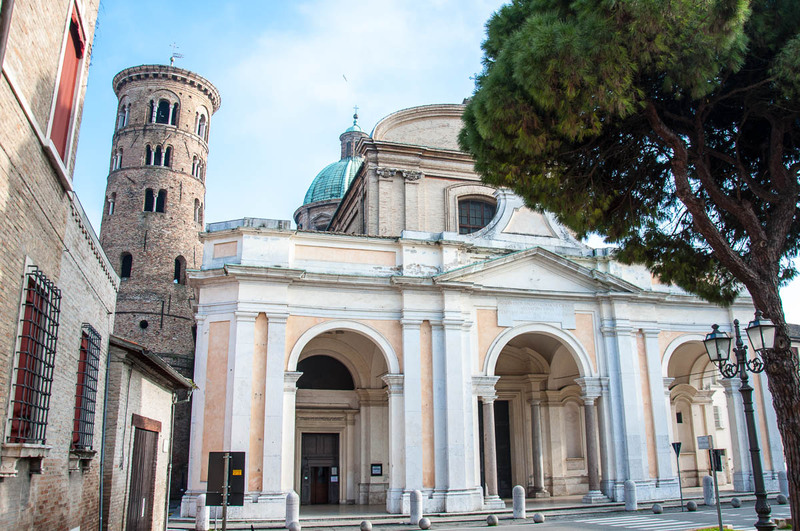 For its plain baroque exterior you wouldn’t think that the Santa Maria Maggiore church in Ravenna would have much to offer to the regular tourist apart from a quick glance at its 9th-10th century circular tower. 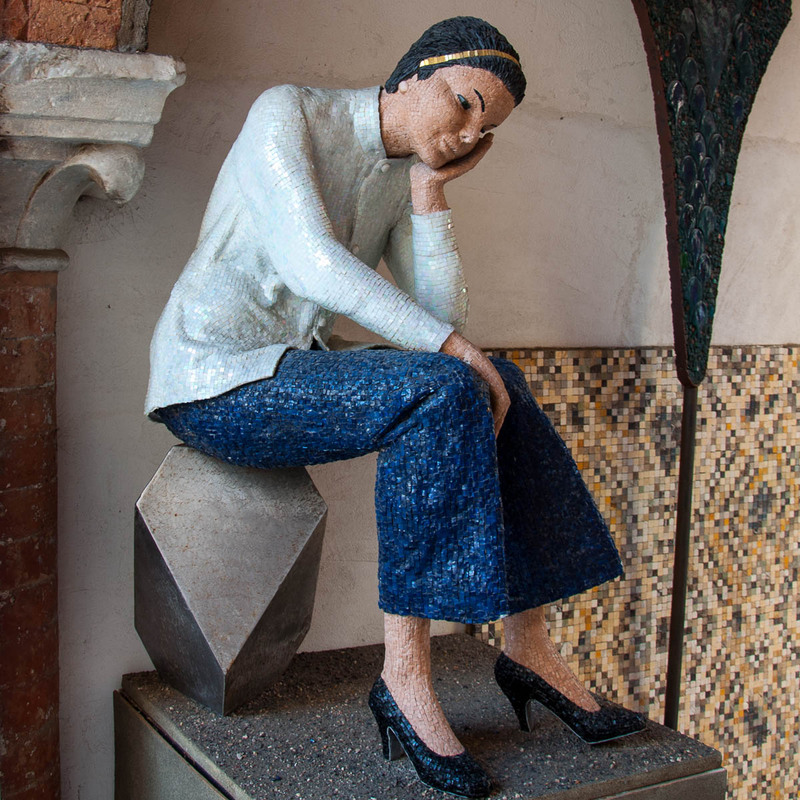 Especially as the church sits opposite the Basilica of San Vitale and the Mausoleum of Galla Placidia – both of which house some of the most stunning Byzantine mosaics you will ever see and admire. Don’t walk by it though. If you take a few minutes out of your day and actually visit the church, on the right hand side you will find an altar with a depiction of Our Lady of the Tumours or La Madonna dei Tumori, as she is known in Italian. It is a slightly faded fresco surrounded by an ornate stucco frame and sculptures, which depicts Our Lady with a red swollen cheek and holding the infant Jesus on her lap. Originally the fresco was known as the Madonna of the Swellings referring to the swellings on the face and other parts of the body which would often be a symptom of incurable diseases. Since the 50’s of the 20th century the fresco has been known as Our Lady of the Tumours (in Latin Sancta Maria a tumoribus). I didn’t take a picture of it, as it felt wrong and intrusive. For a while I was the only person inside the church and yet I felt that the clicking sound of the shutter would shatter the peace and quiet and I didn’t want to do it. A few minutes afterwards people came in to pray to the Madonna and I left, not wanting to intrude on them. There is a special prayer which is offered to Our Lady of the Tumours. We are asked to pray for the pains and hopes of all the people suffering from tumors, pray for their relations living the same sufferings, pray for the doctors taking daily care of the sick, and pray that the Virgin enlightens the minds and guides the hands of all the researchers, so that they can find a remedy against this disease. Traditionally this special prayer is said every day before Mass in the Santa Maria Maggiore Church in Ravenna. At 9 am on the second Saturday of every month a Holy Mess is held for the faithful at the altar of the fresco in order to pray and offer hope to all affected by the disease. Also once a year the feast of Our Lady of the Tumours is celebrated in the church. Unexpectedly for me, Ravenna turned out to possess some of the most impressive bell towers I have had the chance to see. They were either circular or square, jutting high up towards the sky and adorned with dozens of windows starting from the ground and leading up to the top. 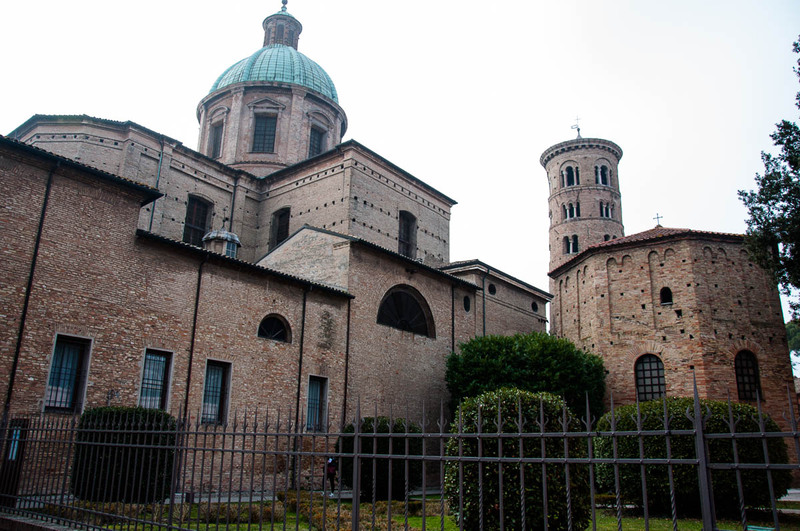 I loved seeing the tower of Ravenna’s Basilica (the Baptistery of Neon is right next to it, so you wouldn’t miss it). The tower of the Santa Maria Maggiore Church (see point 6 above) also caught my imagination. My absolute favourite though was a thick square tower I came across in the maze of streets between the Basilica of San Vitale and Ravenna’s main square Piazza del Popolo. It was tall and leaning – more so than the famous Tower of Pisa. 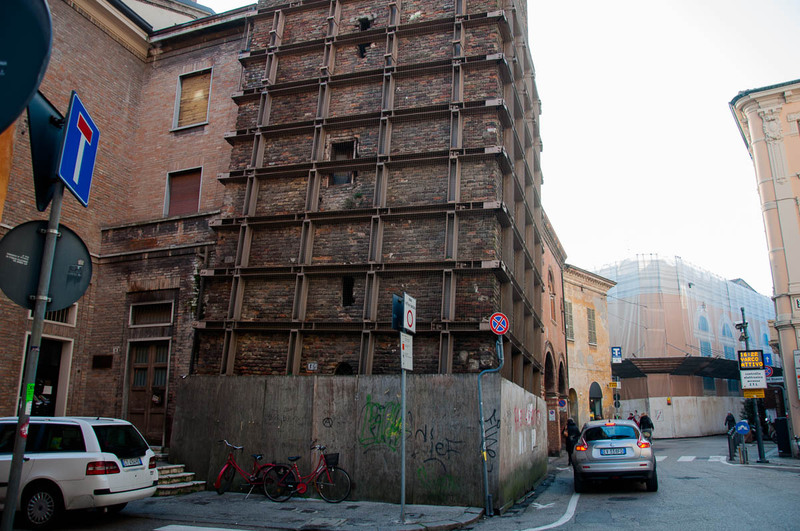 Made of brown bricks, it was enveloped by a metal structure trying to keep it safe and upright for a little longer. Unfortunately, I was unable to take a good picture, as I was rushing towards the fifth and final mosaic sight I could fit in for the day and, on the other hand, suddenly there was a lot of traffic passing by, and I couldn’t simply stand in the middle of the street to snap a photo. 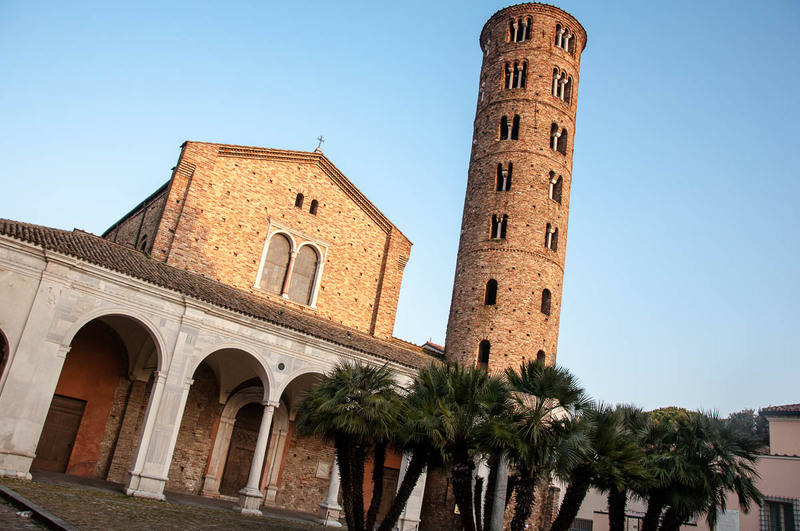 In any case, when you are in Ravenna, don’t miss its towers – they add a lot to the atmosphere of the city. I have to be honest here and tell you that when I first arrived at Ravenna train station, I had a moment of pure fright. The station looked quite dodgy with people loitering around with seemingly nothing to do. I wasn’t sure which way to go and there didn’t seem to be anyone around looking trustworthy enough for me to ask. Now, apologies for the strong statement which is about to follow, but the train stations here in Italy (or at least the ones I have seen, Venice and Verona being a notable exception) tend to be a bit of disconcerting places. Unlike the UK, there isn’t much of a presence of train station employees out and about (they seem to remain mainly inside the ticket booths and offices). And there can be quite a few people just standing there looking you up and down or even approaching you to ask for money or what-not. In principle, I hold my own and try to walk with purpose, but at Ravenna train station I had a big moment of hesitation as I was unsure which way to go and what to do. Finally, I spotted a church just up the road from the station and decided to walk there and see if I can find my bearings. In all honesty there was a big map opposite the station, but I am not good at reading maps of places I am new to and also standing in front of it for a minute or two clearly showed people around that I didn’t know where I was going, so I walked fast towards the church right before being approached. 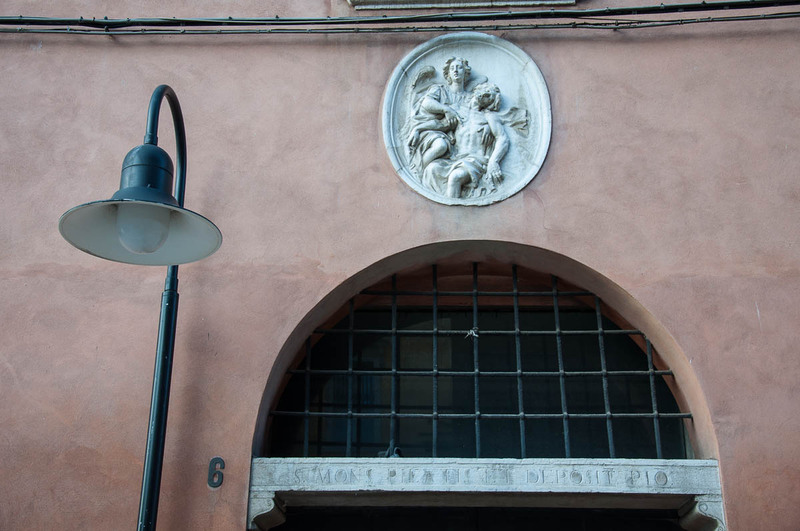 The church turned out to be St. John’s Baptist (in Italian S. Giovanni Evangelista) and from there I simply followed the street straight ahead until I reached Piazza del Popolo (Ravenna’s main square) and then I found the Tourist Office at the nearby Piazza S. Francesco, 7. It was very easy and once my initial discomfort of being in an unknown city subsided, I found it very straightforward to walk around and find the places I needed to see. Plus, throughout the day, I came to see for myself how welcoming and friendly the citizens of Ravenna actually were. I asked several people for directions and everyone was happy to stop and point me to the next church or baptistery on my route, even showing me little shortcuts which only the locals knew about. In the evening the main square and the adjacent streets filled up with groups of people chatting away. 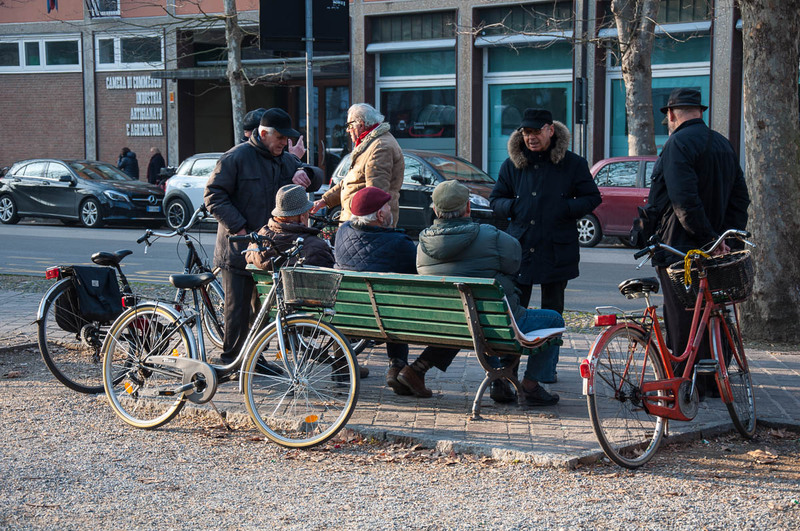 It was very nice to see it all – that almost village-like feel you get when you see people in groups in open urban spaces talking and socialising in a relaxed way. 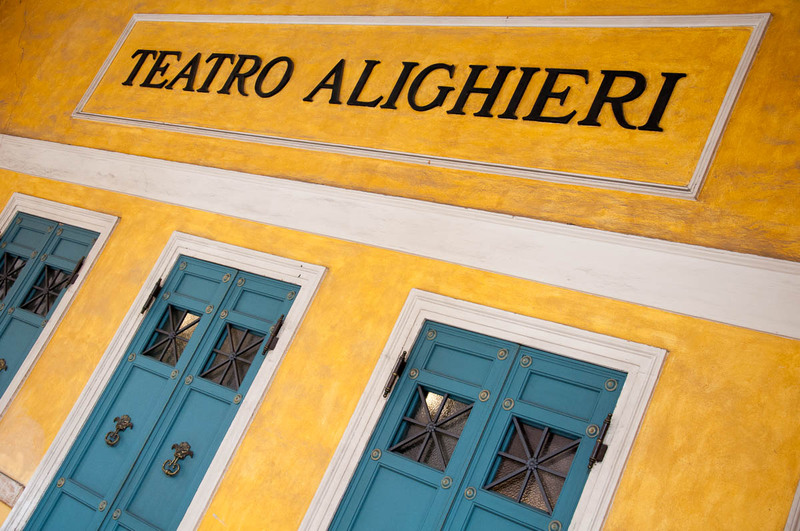 It is one of those things which the larger cities in other countries seem to have lost decades ago and which is still nurtured in Italy and makes living here so enjoyable. You know how it is. Often we go to a place seduced by the idea of seeing a particular main sight. Then we dedicate all our time to it and we never actually stop and admire anything else which may come along our way. Well, don’t let this happen with you and Ravenna for there are many other things to catch your eye and make you stop and think. Little details all over this city will speak out to you, if only you let them. a) the centuries-old cobbles surrounding some of the churches and other religious buildings: I snapped the above picture in the courtyard of Ravenna’s Basilica and the Baptisterium of Neon. 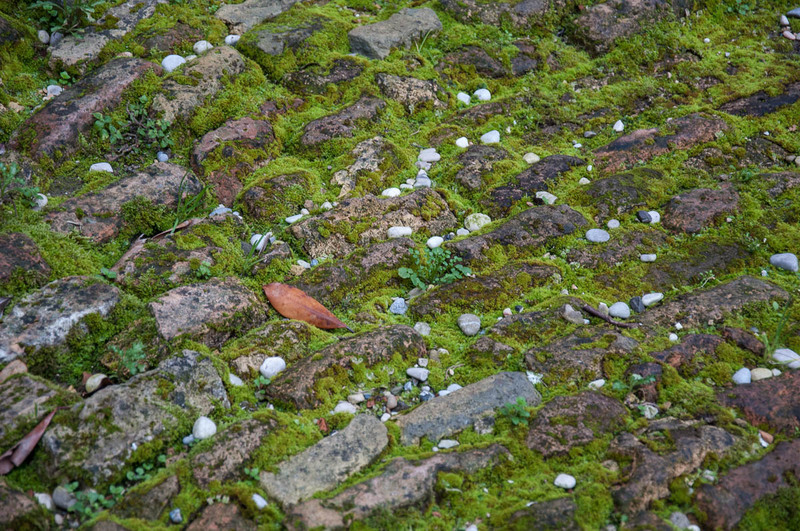 It is an intriguing thought to consider how many people might have stepped on these cobbles through the years leaving in the process their invisible footprint on them. 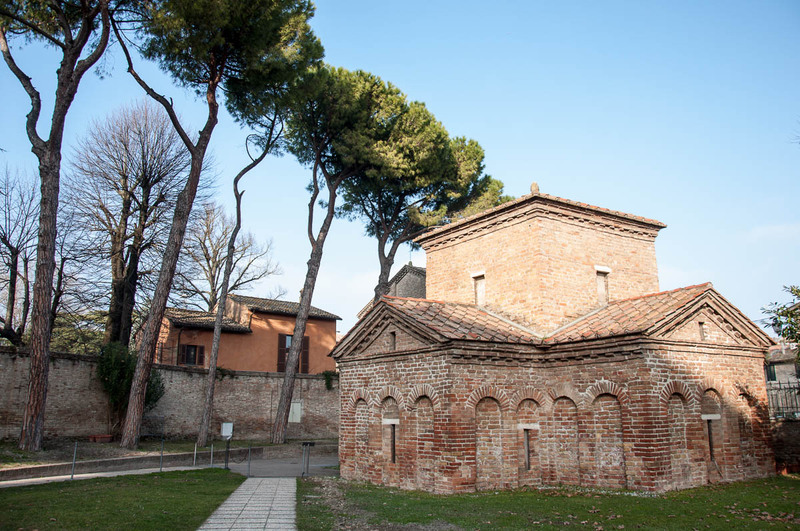 b) the deep foundations of history: Ravenna lies on layers going deeper than two millennia. 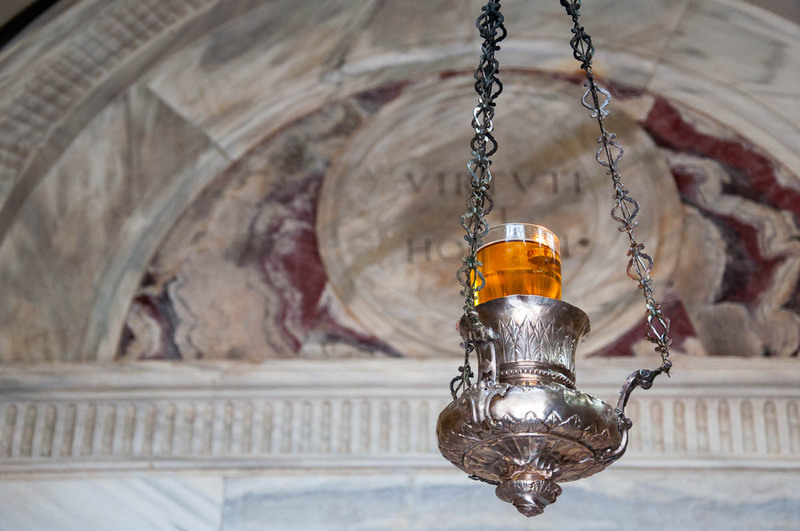 The Baptisterium of Neon, for example, was built at the end of the 4th or beginning of the 5th century AD on the site of an ancient Roman bath. With the passage of time the original floor of the building is now three metres underground! 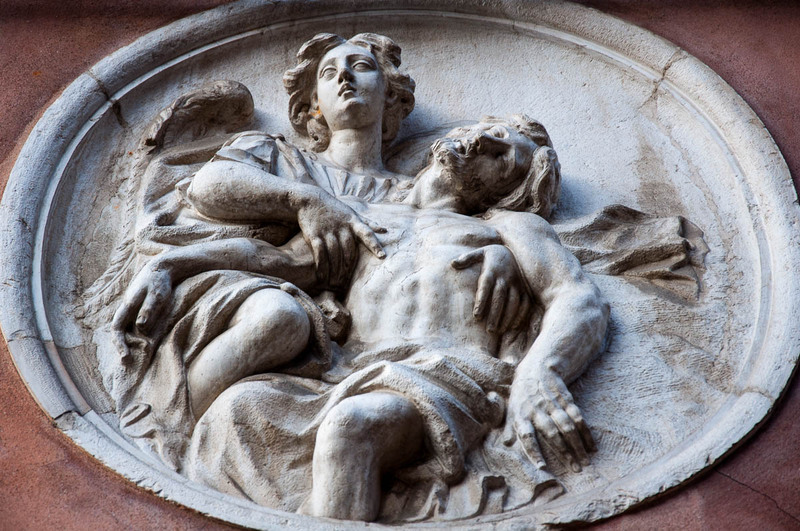 c) The little sculptural medallion depicting the Pieta above the entrance of one of the first pawn banks in Italy: The building on one of Ravenna’s central streets was destined in 1492 to become the seat of the pawn bank Sacro Monte di Pieta. 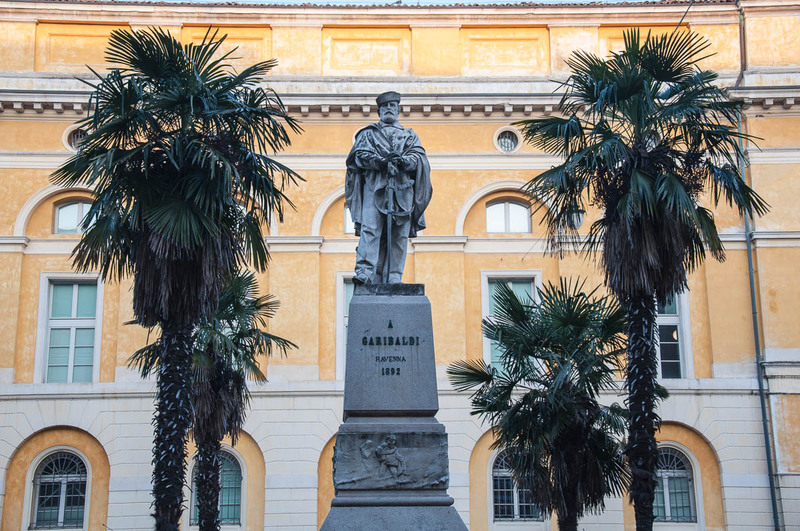 It was set up by archbishop Filasio Roverella with the aim to counteract the monopoly and the high interest rates of the Jewish pawnshops which were supported by the Venetian doge Agostino Barbarigo. 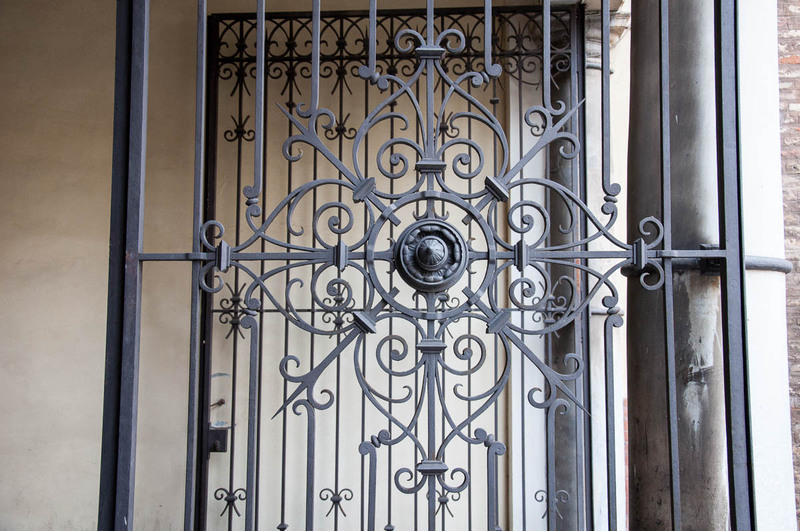 d) the intricate iron-wrought fences, window guards and other such both decorative and practical details: there is a certain poetry in the wrought-iron pieces which you can see all over Italy and the ones I spotted in Ravenna were beautiful in their design and execution. 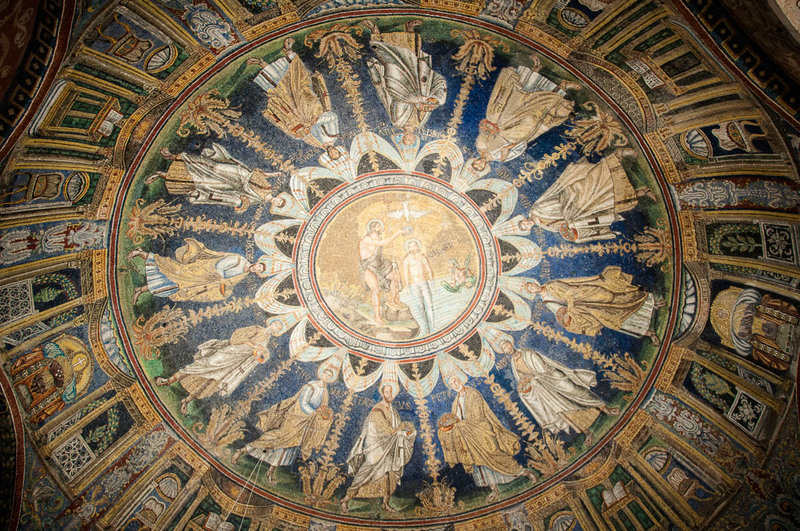 15 centuries after the Byzantine mosaics of Ravenna were placed on the walls of its baptisteries and churches, the city continues to be a world-renowned centre of the mosaic art. Modern mosaic studios can be glimpsed along the city streets. 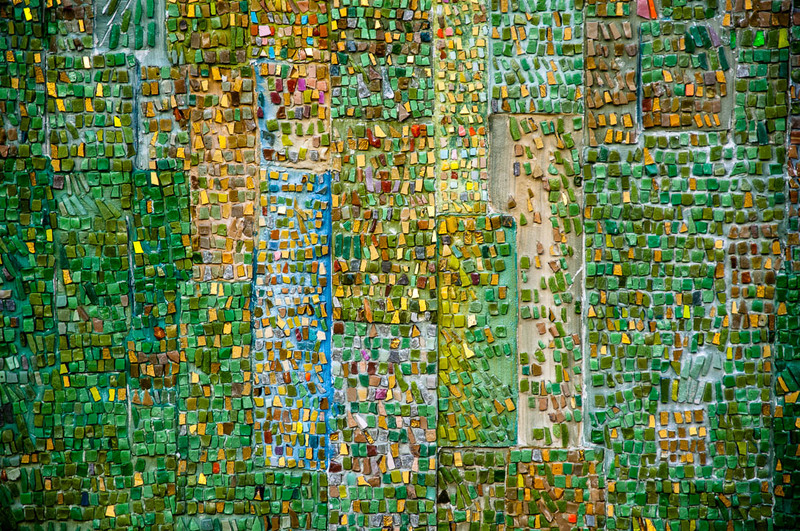 There is a School of the Mosaic Art. And while the excavations continue and discoveries of Byzantine mosaic floors and panels are still being made, at the same time you just have to walk around the city’s historical centre to see the new expressions and uses of the art of the mosaics. 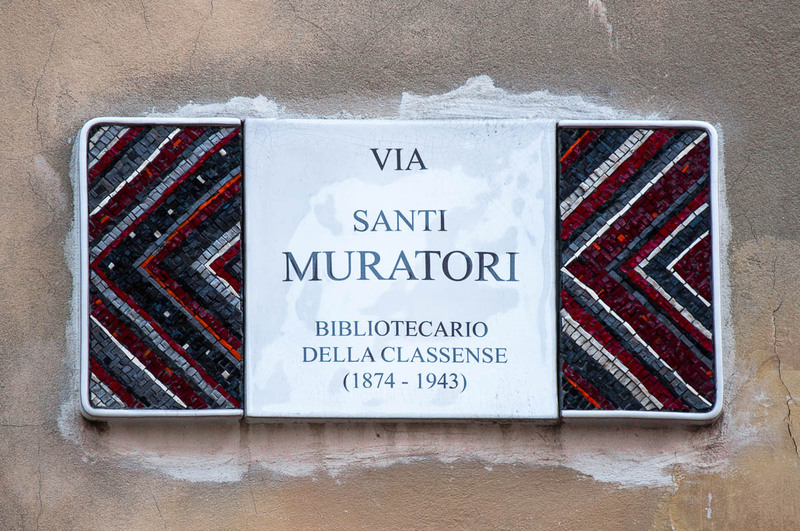 Heck, even the street signs in Ravena are adorned with colourful mosaic pieces! That’s it! 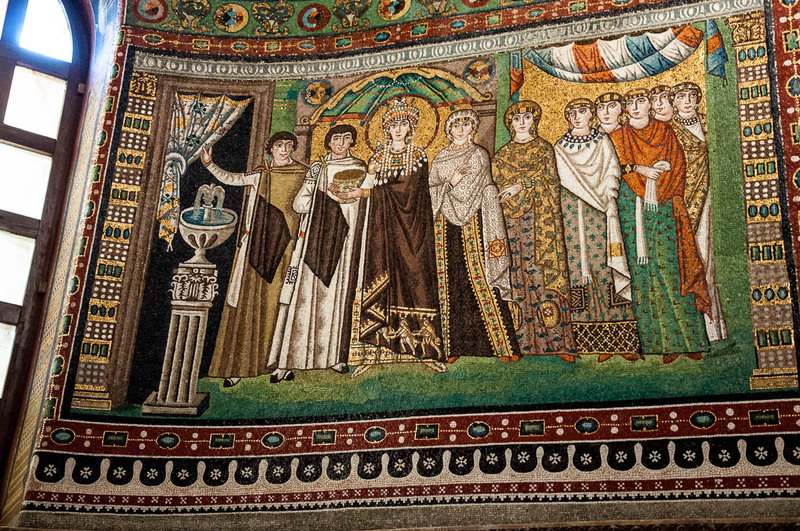 My ten stories about Ravenna to make you want to visit the City of Mosaics now. What do you think? And which story caught your imagination? Let me know! Also, do share with me if you have already been to Ravenna. 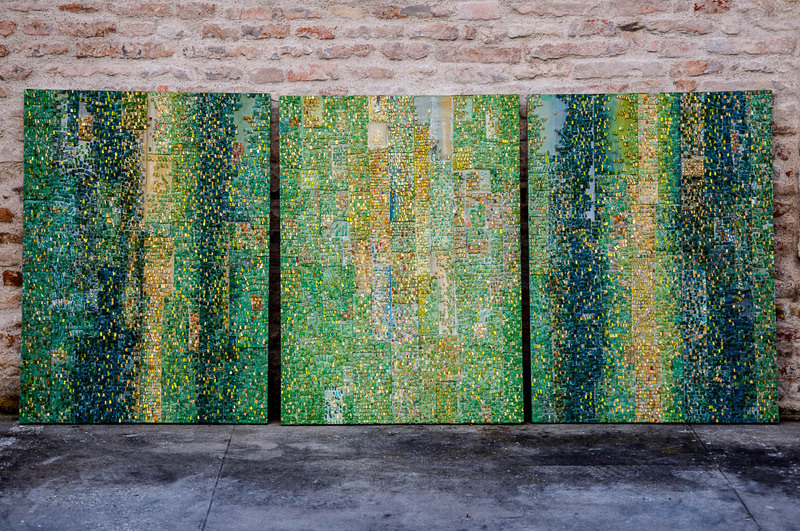 What did you see there and what did you think of the city and its mosaics? 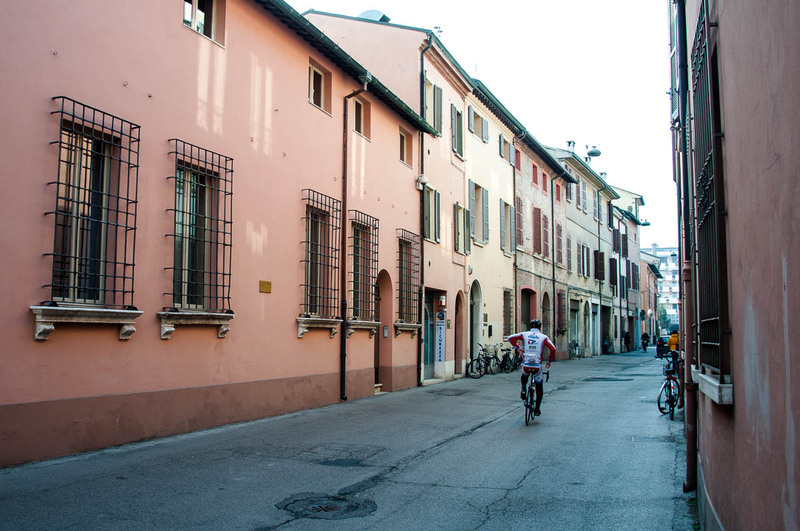 I loved your commentary on Ravenna, one of my favorite cities in Italy. The Tomb of Galla Placidia is a little jewel, with its mosaics of bright stars on a blue sky. She had an eventful life, being married to both a Visigoth chief and later the Roman Emperor Constantine III.One hopes she would have been happy to be buried there. Walking into the Mausoleum of Galla Placidia was really an unforgettable experience for me. Seeing the blue sky with its stars and then all the intricate mosaics all over the walls and the ceiling in the dim light was a revelation! I am sure anyone would be happy to have such a splendid final resting place! I really enjoyed your post. Stunning pictures! 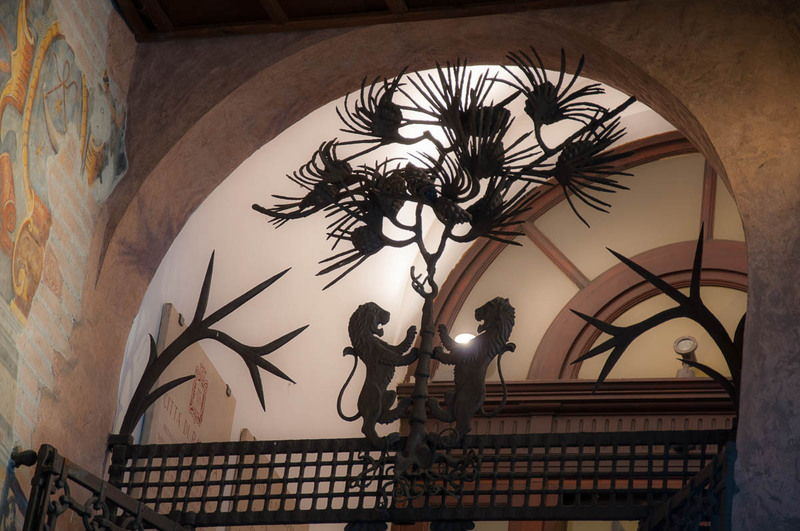 My husband and I will be visiting Ravenna by train from Bologna for just one day in late Sept., do you recommend a pass for all museums or pay as we go? Also, is there anything special to try regarding food/drink or restaurant you recommend for our lunch. Thank you so much for your help in advance. Thank you for reading and for your very kind words about my blog. I really appreciate them. The combined ticket is very convenient. If I remember well, it cost about ten euros at the time for five or six sights. It was a great price and having one ticket saved me time at every sight as I just needed to show it and walk in instead of spending time buying a single ticket. So, yes, I recommend it. 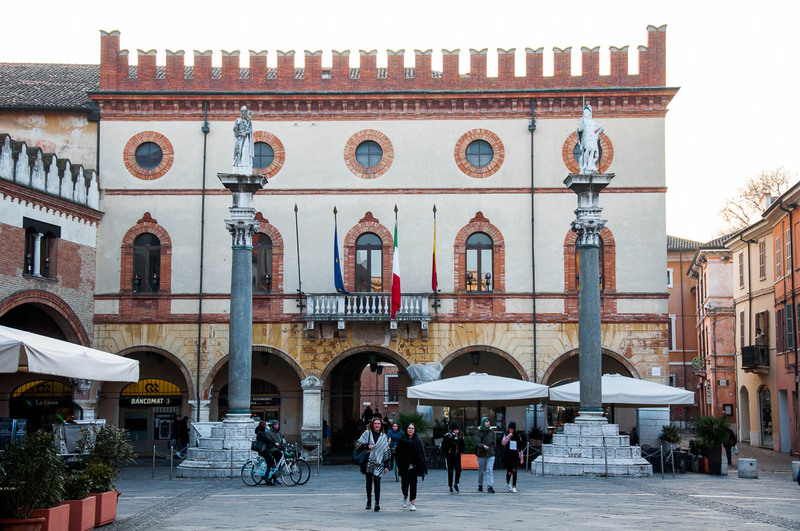 With regards to food – Ravenna is in Emilia-Romagna – the Northern Italian region which is widely renowned for its food. Unfortunately, I had very little time in Ravenna and spent it rushing from one sight to another. They were all so beautiful, I wanted to see as much as possible and didn’t care much for food. In the end, I had time for a quick coffee in a centrally located cafe called Caffe Letterario which also served meals and they looked wonderful but I had 5 minutes and had to run to catch the train. So, instead of personal recommendations, I found this blog post for you with examples what to eat in Ravenna: https://blog.travelemiliaromagna.com/what-to-eat-ravenna. You can also contact the local Tourist Office on http://www.turismo.ra.it/eng/Homepage and ask if they can recommend restaurants and eateries in town (they also have a Hotels and Restaurants.section on their website). Have a great time in Ravenna! Здравейте, с огромно удоволствие чета блога Ви. Планирам посещение на Равена декември месец и информацията , която ми давате е изключително полезна. В програмата ни е и Болоня, но ще имаме и възможност освен двата града да посетим и още един. Мисля за Ферара и ще съм Ви благодарна, ако ми дадете някаква информация. А може и да ми препоръчате друго място, което би било интересно. Благодаря и Ви желая хубав ден! I have been wanting to go to Ravenna for ages as I make mosaics. Definitely must start saving as your article really inspired me. Also read your blog about winter blues. Emerging from horrible English weatther over past few months (Did I say few!!!) Having come from South Africa I really hate this climate and lack of colour. You write very well. Thank you.